Easily move and resize windows using multi-touch gestures. Is there a better alternative to move+resize? Is move+resize really the best app in Desktop category? Will move+resize work good on macOS 10.13.4? move+resize helps you fit multiple windows on your desktop nicely and effortlessly. 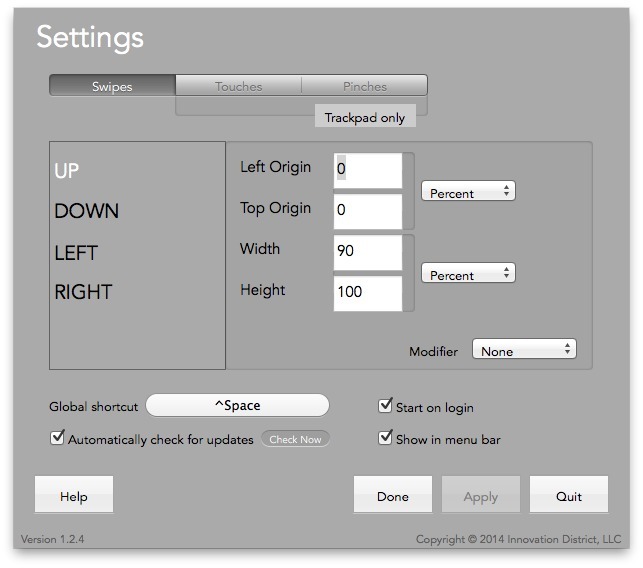 It is a highly customizable window management tool that enables you to input a percentage of the screen or exact pixels! When you want to reposition a window, swipes, touch zones or pinches are all you need to do. After you save the window size with selected gesture, you can apply this preset to any window. With move+resize, it is never difficult to get your windows to the exact size and position you desire. move+resize needs a review. Be the first to review this app and get the discussion started!